The steep declines in Russia’s currency pose major dilemmas for the countries of Central Asia. Since October 9, the first day in post-Soviet history that the ruble-to-dollar exchange rate climbed above 40, the Russian currency was consistently hammered, until it managed to end last week’s rollercoaster below 60. Post-Soviet economies to the South of Russia have been hit by the financial crisis in Moscow. Although Central Asian trade with Russia is declining, in favor of a surge in business with China, all countries in Central Asia still maintain strong economic relations with Russia. This means that any crisis in Russia is immediately felt in Central Asia. The two poorest economies in Central Asia, Tajikistan and Kyrgyzstan, are also among the most Russia-dependent in the entire post-Soviet space. Dushanbe and Bishkek’s budgets depend heavily on remittances from migrant workers living in Russia. The ruble, together with the dollar, is widely available in both countries and exchange rates are a significant indicator of the stability of their economies. With the ruble crumbling, Tajikistan’s somoni has reacted very slowly on the official market: The increase against the dollar since October 9 has been just below 3 percent. However, it is worth noting that for four consecutive days last week the official rate hiked almost 4 percent each day before rebounding back to 5.13 somoni per dollar. In the same period, the Kyrgyz som gradually weakened against the dollar, declining 4.5 percent. Notably, for the first time, the som became more valuable than the ruble. In the past two months alone, the ruble has lost between 55 and 40 percent of its value against the dollar, and has also lost ground against the somoni and som. This could have dangerous consequences for worker remittances from expat Central Asian workers. 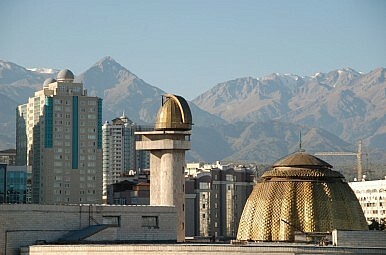 The Kyrgyz government is preparing for windfalls from abroad to fall by at least $1 billion. The drought in remittances, accompanied by government spending to keep their currencies closer to the dollar, poses a direct threat to the budgets of Tajikistan and Kyrgyzstan. Uzbekistan has the advantage of a more diversified, independent economy. Since October 9, the Uzbek currency – also called the som – has lost only 2.37 percent against the dollar, although it is down 11 percent year on year. The two energy-rich countries, Turkmenistan and Kazakhstan have managed to keep their currencies pegged to the dollar, using their foreign reserves to keep rates stable and defend the manat and tenge. In Kazakhstan, in particular, fears of a second devaluation in 2014 have eased. Worried about the stability of the ruble, Central Asian countries have clung to the dollar in an effort to maintain credibility internationally and keep their citizens from taking to the streets. This decision could, however, harm trade relations with Russia and reduce the purchasing power of ruble remittances sent by migrant workers. The situation in Moscow poses a dangerous dilemma for Central Asian leaders, which must choose between either draining their reserves to defend their currency or allowing a devaluation, with a high risk of discontent in Kazakhstan, Tajikistan, and Kyrgyzstan, where inflation is already high. With interest rates looking set to rise in the U.S., emerging markets will receive fewer dollars and the U.S. dollar will strengthen. That is likely to put even more pressure on Central Asian leaders. How Low Can Kazakhstan’s Tenge Go? Astana sees its currency hit a new low and ponders gas below $37 a barrel. The claim has yet to be verified, but is consistent with suspicions there was foreign involvement in the attacks. As Beijing connects to the world's largest Muslim markets, its attention to halal tourism lags behind Taiwan's efforts. Indonesia’s Surprisingly Quiet ElectionIndian Elections: Kashmir VotesCritical Shifts in India’s Outer Space PolicyAnatomy of a Taiwan Invasion Part 2: Missile and Naval DomainsIs the Taliban’s Former Capital Ready to Welcome Them Back?